1. You gotta be LIN it to LIN it原為美俚語You gotta be IN it to WIN it意即"要成功必先用心投入"
4. Does this look LIN-fected to you?原為Does this look infected to you? ... 運球試探步 (中文字幕) 觀看次數：48. 0:14. 絕技~要救球反而 ... 7分鐘 全紀錄 Jeremy Lin 林書豪 25分 7 ... 台中3C高空鋼管秀. 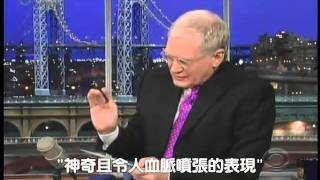 Jeremy Lin 林書豪Letterman show 大衛雷特曼秀(中文字幕) 隨便翻翻隨便看看譯者補遺: 十大最爛林書豪造字worst lin puns top 10 list 1.